Paddy Lowe, Chief Technical Officer: Today we had Robert in the morning and Lance in the afternoon and our focus was to work with the different tyre compounds, something we haven’t done so far in this winter testing. We had good reliability all day, and some reasonably good running with Robert in the morning, and actually his first chance to really drive the car in decent conditions. So, I’m sure with more time, he could have improved even further, but some good results and some good information from Robert. The afternoon started well with Lance but unfortunately, we lost our way with the set-up and didn’t find any lap time with the softer compounds, but actually by the end of the day, we discovered some important directions and we can work further with this tomorrow. Robert Kubica: This morning it was my second time in the car. The conditions were better than last week with higher temperatures, although in the morning it was still quite cold. I did another half day to get some more running and complete more specific tests on the car in order to get more data. We tried a softer compound, going from the soft to supersoft, just to get the basic information that we have on the tyre. Now we have to go through the data and try to analyse everything. 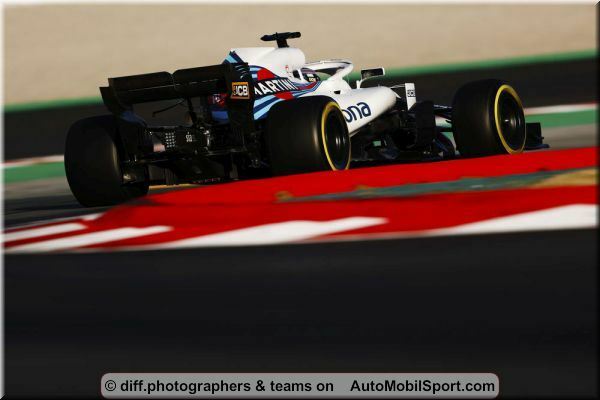 Lance Stroll: I feel good, we have got kilometres on the car so I am looking forward to heading to Australia. You have just got to keep chipping away at it and that is the key for now, as there is still a lot to work on, but everyone is in the same boat. We really don't know where we stand right now and will have to see in Melbourne. There is not much you can see from the timesheets, as everyone is running different fuel levels and doing lots of different things. The midfield will most probably be closer than last year because of the developments by everyone. This week we did more running and it was better weather, so we had much better conditions. The car still needs some work on it to understand the balance, tyres and all that, but we shall see. The FW41 returns to the track tomorrow for the final day of pre-season testing, with Sergey driving in the morning session, before handing over to Lance in the afternoon.